In New England, one learns to go 'with the flow' as 'they' say. Wonder how you spend your winter months? 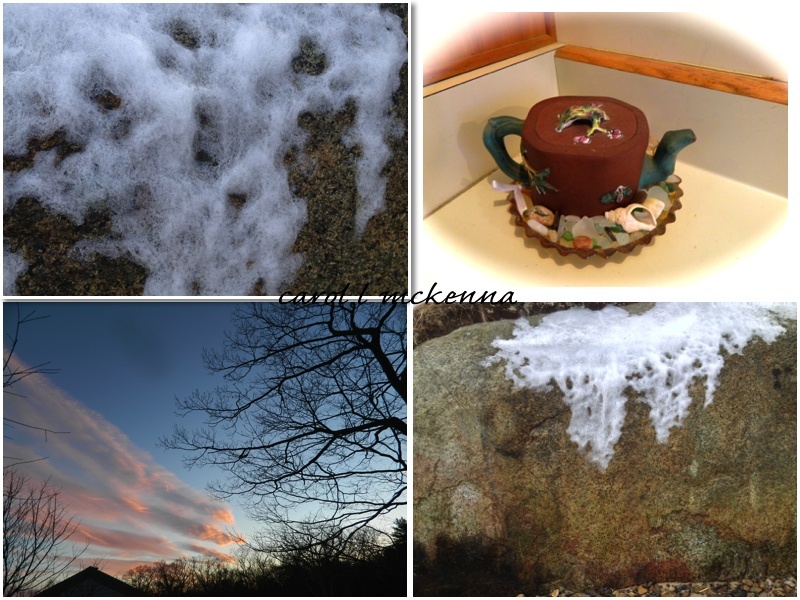 Lovely post and images, Carol! Your fair weather sky is beautiful. I am looking froward to some warmer weather and fair skies. Have a great evening and a happy week ahead. Fairweather sky is lovely Carol. Great winter photos. I can feel the chill from the nature in my bones, and then becoming warm again, by the help of a hot cup of tea. I have learned to love my life, even if I don't understand it. 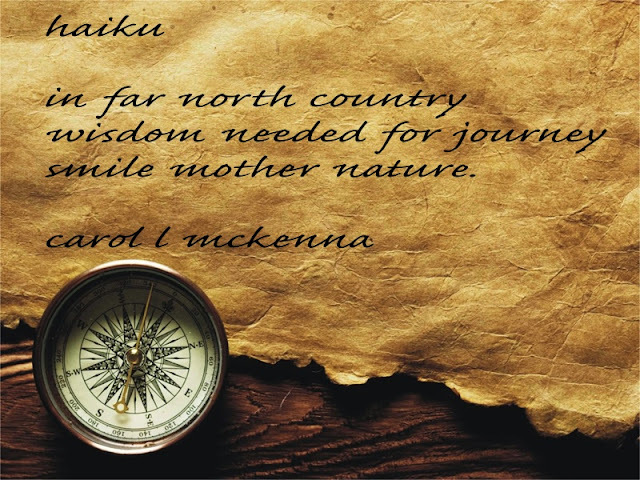 How true your haiku! When I lived in New England many years ago the saying was, "If you don't like the weather , wait a minute!" I'm a North Woods person. I really like this! Wisdom needed just in the far north country? Oh, I'm sure I need it here too! Hey what a bonus, a great collage and a haiku!! Lovely mosaic that you have done! Bet Art Muse Dog will be very happy when the warmer weather comes. I think that fortitude is needed as well as wisdom! Great pics and love the haiku. Brrrrrr! We are much warmer over here. Thanks for your very good comment! My favorite today "Fair Weather Sky"....the pink hues on the clouds make it a perfect day. Pretty photos, but it does look cold! I wish I understood Google+ better. Actually I haven't really tried...just seems like one more thing to complicate my life. Your images of Ice on the Rocks (love the title)are very intriguing. Nature has so many beautiful surprises for us every day. Our winter is already drawing to a close here in Texas. We had a mild one so I've been able to keep doors and windows open as I paint. Extreme heat makes it pretty impossible to do that in the summer. It's always best when Mother Nature smiles. Nice one. I always enjoy your posts very much. This was wonderful. Great mosaic! The fair weather sky is beautiful. I like the quote too. Are you saying that Mother Nature smiles at our supposed wisdom? Beautiful images with lovely poems. Your post makes me long for a cup of tea! Thank you for this delightful invitation! I grew up in New England. I know how cold the winters are there. Brr!! Try to stay warm. I'm so glad I was able to find you easily today. I have been frustrated by Google Plus! Fabulous Fotos and love the haiku. Love that lacy one with the rock...very unique. Carol, I had a customer remind me of the benefits of snow as I complained about our recent blizzard the other day. She wisely reminded me that we live in the great lake state and we had a drought this summer so the snow is sorely needed to replenish our lakes. So I will agree with you; it is a good time to regroup and tend to our creative side within our homes. I love the teapot. Keep warm. What wonderful pictures of your winter! I enjoyed the haiku also. I like your ice on the rocks! Nothing like a hot pot of tea and cake on a cold day. I look forward to the snow if we have fair weather skies like that. Our weather is fluctuated by 9 degrees at the moment, very strange, snow one day and disappeared the next.